CROWN HEIGHTS — A sprawling former military building in Crown Heights could become a hotel, business incubator, supermarket or recreation center, according to proposals the city's Economic Development Corporation received for the space. 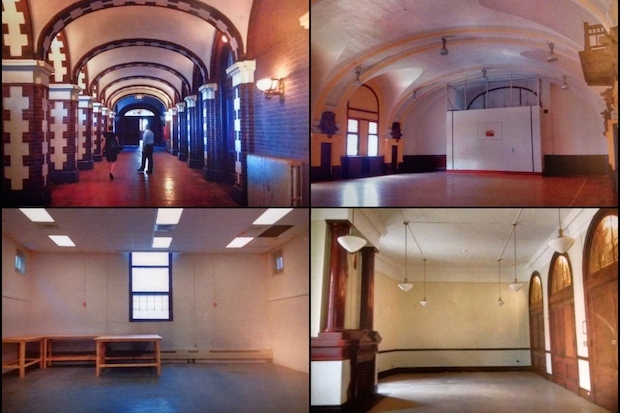 The Bedford Union Armory, at Bedford Avenue and Union Street, is currently empty, but for the past year the city has sought ideas from developers on what to do with the 138,000-square-foot building. The EDC held a community meeting on Sunday night to present some of the developers' proposals and get feedback from residents. While Downing wanted to hear the community's thoughts, she emphasized that the plan for the armory must be financially viable in the long term. “We’re going to make sure that the team that we move forward with is coming to the table and meaningfully investing in this community," she said, "but one of the ways we can best set up this project for success is to include uses that can pay for themselves." Proposals developers have submitted so far include a hotel, housing (either sales or rentals), a performing arts space with ticketed events, office space for local businesses and retail space for a pharmacy or a grocery store, Downing said. “No matter what uses we have in this armory, this is going to be an expensive project,” she said. After the EDC’s presentation, small groups of residents brainstormed what they want to see at the building and submitted their top choices to the agency. The most popular ideas included mixed-income housing, a fitness center and space for job training and workforce development, an EDC spokesman said. The residents also made it clear they do not want the building to be turned into a hotel, he said. “One thing I want to be very clear about is that this is going through a different process. The Barclays Center project went through a state process that did not require as much community input,” she said. The armory will go through the city's Uniform Land Use Review Procedure (ULURP), which requires reviews by the local community board as well as elected officials, Downing said. Borough President Eric Adams, who will weigh in on the project during the ULURP, reassured residents that he was listening to their input. “This is a beginning process," he said. "No one is going to sell out this community." A second town hall meeting about the future of the Bedford Union Armory will take place on Tuesday, Oct. 21 between 6 p.m. and 8:30 p.m. at the Friends of Crown Heights at 671 Prospect Place.